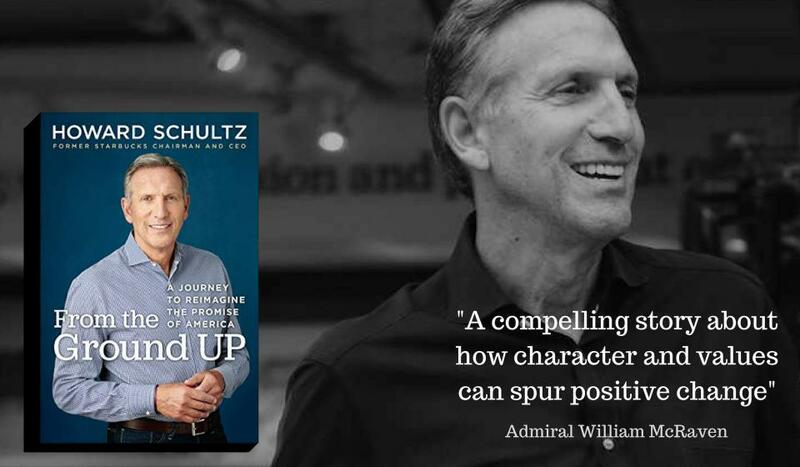 Tuesday, March 5, Interabang Books will present A Conversation with Howard Schultz, an SMU Tate Lecture Series Special Event at McFarlin Auditorium on the SMU campus. A copy of his new book is included with each $50 ticket. To purchase, click here. Howard Schultz, the former chairman and CEO of Starbucks, led the java giant from 11 cafes around Seattle to more than 28,000 locations worldwide and a fifth-place ranking on Fortune’s latest list of “the World’s Most Admired Companies.” In From the Ground Up: A Journey to Reimagine the Promise of America, Howard Schultz shares his untold personal story and lays out his vision for how companies can improve their social impact. What do we owe one another? How do we channel our drive, our ingenuity, even our pain, into something more meaningful than individual success? These questions, at the heart of the American journey, are also ones that Howard Schultz has grappled with from his childhood in Brooklyn’s housing projects to his rise as a business icon. The author of other books including Pour Your Heart Into It: How Starbucks Built a Company One Cup at a Time, Howard Schultz is also the former owner of the Seattle SuperSonics and, with his wife Sheri, the founder of the Schultz Family Foundation, which supports national initiatives focused on employment and the needs of veterans.